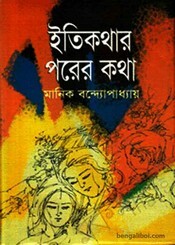 Manik Bandyopadhyay is one of them of the few writers who introduced a revolutionary trend in Bangla literature. The main content of his composition was the artificiality of the middle class society, the struggles of the working people, determinism etc. Many novels and short stories are written in the ocular experience of soil and human life. His written novels- 'Putul Nacher Itikatha', 'Diba Ratrir Kabya', 'Padma Nadir Majhi', Janani' and story compilations- 'Atasimami', 'Pragoitihasik', 'Chhotobakulpurer Jatri', these are considered one of the greatest assets of Bengali literature. Now I want to share an another classic novel of this legend author- Itikathar Parer Katha. The ebook pdf has 242 pages, 19 mb file size.